Sue was nine years old when she started her basketball career with the YMCA in 1969, later playing as a senior with the Weston Creek Woden Dodgers basketball club. Following her local success Sue accepted a scholarship with the University of Alabama Birmingham in 1980. A medical examination showed that she had a slight heart murmur and despite her willingness to sign a waiver, the opportunity didn’t proceed and she returned to Australia. Between 1983 and 1984, Sue held a basketball scholarship at the Australian Institute of Sport, and was only the second female basketball player from the ACT to do so. Between 1983 and 1986, Sue played 51 games for Australia, and became the first ACT born female basketball player to be selected for the Australian women’s Olympic basketball team where she represented her country at the 1984 Los Angeles Olympics. 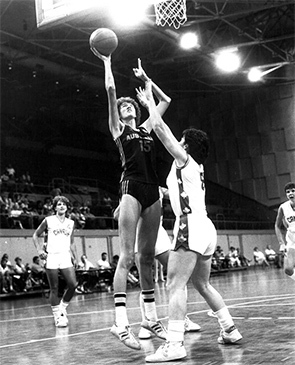 At the Games, Sue played a prominent role in Australia’s 62-59 win against Yugoslavia in the playoff for fifth and sixth place. Sue also represented Australia at the 1986 World Championships held in the Soviet Union. In 1985 as a member of the Canberra Capital’s Australian Women’s Basketball Conference team, her contribution to an undefeated season and the Premiership win led directly to the Capitals’ entry into the National Women’s Basketball League. Sue played for the Capitals in 1986 and 1987. In 1988 at the age of 29 Sue retired due to a recurring knee injury. Sue died from heart failure, a consequence of Mafran Syndrome on 14 September 1998, aged 39. At 206cm tall, Sue was Australia’s tallest ever international female basketball player. The Sue Geh Cup was created in her honour by Basketball ACT for competition between primary schoolgirls’ teams in the ACT. In 1999 a street in Nicholls (where the theme of the street names is Sportsmen and Sportswomen) was named in Sue’s honour.